Nuby Orthodontic Pacifier with Handle | Blue | �massage and stimulate your baby's gums. 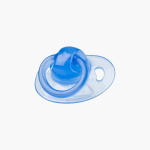 Alleviate the pain of your baby during the teeth eruption phase with the help of this pacifier. Designed in a way to offer a snug fit, it is BPA-free and is safe for your little one. It has a handle at the back for easy removal and insertion of the pacifier. Feature 1 : �massage and stimulate your baby's gums.